New research from NASA's Lunar Science Institute indicates that the solar wind may be charging certain regions at the lunar poles to hundreds of volts. 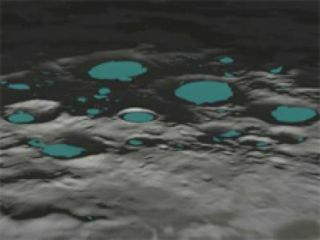 Exploringthe craters at the moon's north and south poles may be even more challengingthan previously thought for future astronauts. New NASA calculations now showthat solar wind streaming over the rough lunar surface may electrically chargepolar craters on the moon. The moon'spolar craters are of particular interest to researchers because resources,including water ice, exist at theselunar structures. The moon's orientation to the sun keeps the bottoms of polarcraters in permanent shadow, allowing temperatures there to plunge below minus400 degrees Fahrenheit (minus 240 degrees Celsius), cold enough to storevolatile material like water for billions of years. "However,our research suggests that, in addition to the wicked cold, explorers androbots at the bottoms of polar lunar craters may have to contend with a complexelectrical environment as well, which can affect surface chemistry, staticdischarge, and dust cling," said William Farrell of NASA's Goddard SpaceFlight Center in Greenbelt, Md., the lead author of the study. These newobservations contribute to our evolving understanding of the moon, said GregorySchmidt, deputy director of the NASA Lunar Science Institute at NASA's AmesResearch Center in Moffett Field, Calif.
"Thisimportant work by Dr. Farrell and his team is further evidence that our view onthe moon has changed dramatically in recent years," Schmidt said. "Ithas a dynamic and fascinating environment that we are only beginning tounderstand." Solar wind is a thin stream of electrifiedcomponents of atoms ? negatively charged electrons and positively charged ions? that constantly blows from the surface of the sun into space. Since the moonis only slightly tilted compared to the sun, the solar wind flows almosthorizontally over the lunar surface at the poles, and along the region of themoon called the terminator, where day transitions to night. Theresearchers discovered that in some ways, solar wind behaves like wind on Earth? flowing into deep polar valleys and crater floors. But, unlike wind on Earth,the dual electron-ion composition of the solar wind may create an unusualelectric charge on the side of the mountain or crater wall; that is, on theinside of the rim directly below the solar wind flow. As solarwind flows into craters, it can erode the surface, which affects recentlydiscovered water molecules. Static discharge could disturb sensitive equipment,while the sticky and extremely abrasive lunar dust could wear out spacesuitsand may even be hazardous if tracked inside spacecraft and inhaled byastronauts over long periods of time. Sinceelectrons are over 1,000 times lighter than ions, these lighter electrons inthe solar wind rush into a lunar crater ahead of the heavier ions, creating anegatively-charged region within the crater. The ionseventually fill the crater, but at consistently lower concentrations than thatof the electrons. This imbalance in the crater makes the inside walls and flooracquire a negative electric charge. The researchers calculated that theelectron/ion separation effect is most extreme on a crater's leeward edge ?along the inside crater wall and at the crater floor nearest the solar windflow. Along thisinner edge, the heavier ions have the greatest difficulty reaching the surface,unable to make the sharp turns over the mountain tops the way the lighterelectrons can. "Theelectrons build up an electron cloud on this leeward edge of the crater walland floor, which can create an unusually large negative charge of a few hundredvolts relative to the dense solar wind flowing over the top," Farrell said. Still, thenegative charge along this leeward edge won't build up indefinitely.Eventually, the attraction between the negatively-charged region and positiveions in the solar wind will cause some other unusual electric current to flow. The researchteam believes that a possible source for this current could benegatively-charged dust that is repelled by the negatively-charged surface thatthen gets levitated and flows away from the electrified region. "The Apollo astronauts in the orbitingCommand Module saw faint rays on the lunar horizon during sunrise that mighthave been scattered light from electrically lofted dust," Farrell said. "Additionally, the Apollo 17 mission landed at a site similar to a craterenvironment ? the Taurus-Littrow valley. The Lunar Ejecta and MeteoriteExperiment left by the Apollo 17 astronauts detected impacts from dust atterminator crossings where the solar wind is nearly-horizontal flowing, similarto the situation over polar craters." To furtherthis research, scientists want to create more complex computer models. "Wewant to develop a fully three-dimensional model to examine the effects of solarwind expansion around the edges of a mountain," Farrell said. "We nowexamine the vertical expansion, but we want to also know what happenshorizontally." The detailsof the study were published March 24 in the Journal of Geophysical Research.The research is part of the Lunar Science Institute's Dynamic Response of theEnvironment at the moon (DREAM) project. ?